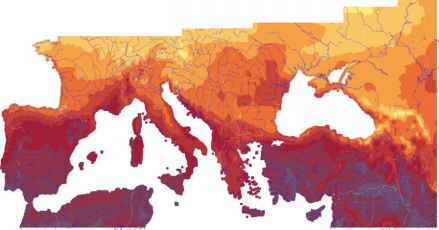 FIGURE 2.30 Annual total solar irradiation on horizontal surface for Europe. Source: Meteonorm database of Meteotest (www.Meteonorm.com). 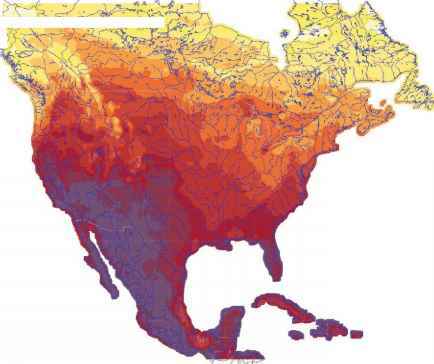 FIGURE 2.31 Annual total solar irradiation on horizontal surface for North America. Source: Meteonorm database of Meteotest (www.Meteonorm.com). Note: Concentration ratio is defined as the aperture area divided by the receiver/absorber area of the collector. 2. Stationary compound parabolic collectors (CPCs). 3. Evacuated tube collectors (ETCs). FIGURE 3.1 Typical flat-plate collector. (a) Pictorial view of a flat-plate collector. (b) Photograph of a cut header and riser flat-plate collector. and riser collector is the typical design for flat-plate collectors. An alternative is the serpentine design shown on the right-hand side of Figure 3.1a. 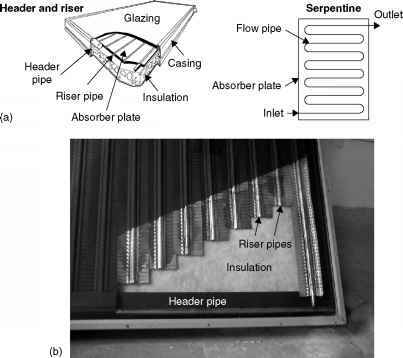 This collector does not present the potential problem of uneven flow distribution in the various riser tubes of the header and riser design, but serpentine collectors cannot work effectively in thermosiphon mode (natural circulation) and need a pump to circulate the heat transfer fluid (see Chapter 5). The absorber plate can be a single sheet on which all risers are fixed, or each riser can be fixed on a separate fin, as shown in Figure 3.1b. The transparent cover is used to reduce convection losses from the absorber plate through the restraint of the stagnant air layer between the absorber plate and the glass. 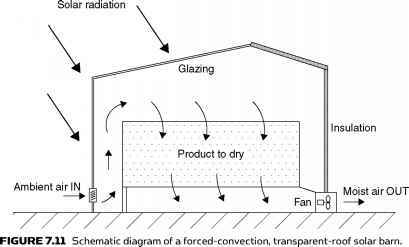 It also reduces radiation losses from the collector because the glass is transparent to the shortwave radiation received by the sun, but it is nearly opaque to longwave thermal radiation emitted by the absorber plate (greenhouse effect). The advantages of flat-plate collectors are that they are inexpensive to manufacture, they collect both beam and diffuse radiation, and they are permanently fixed in position, so no tracking of the sun is required. The collectors should be oriented directly toward the equator, facing south in the Northern Hemisphere and north in the Southern Hemisphere. The optimum tilt angle of the collector is equal to the latitude of the location, with angle variations of 10° to 15° more or less, depending on the application (Kalogirou, 2003). If the application is solar cooling, then the optimum angle is latitude -10° so that the sun will be perpendicular to the collector during summertime, when the energy will be mostly required. If the application is space heating, then the optimal angle is latitude + 10°; whereas for annual hot water production, it is latitude +5°, to have relatively better performance during wintertime, when hot water is mostly required. • Cover. One or more sheets of glass or other radiation-transmitting material. • Heat removal fluid passageways. Tubes, fins, or passages that conduct or direct the heat transfer fluid from the inlet to the outlet. • Absorber plate. Flat, corrugated, or grooved plates, to which the tubes, fins, or passages are attached. A typical attachment method is the embedded fixing shown in the detail of Figure 3.2. The plate is usually coated with a high-absorptance, low-emittance layer. • Headers or manifolds. Pipes and ducts to admit and discharge the fluid. • Insulation. Used to minimize the heat loss from the back and sides of the collector. • Container. The casing surrounds the aforementioned components and protects them from dust, moisture, and any other material. 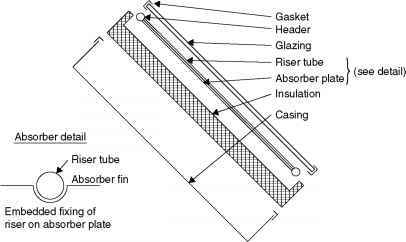 :-plate collector and absorber details. 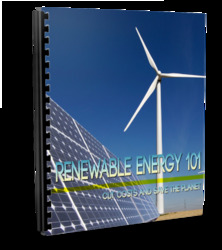 solar energy as possible at the lowest possible total cost. The collector should also have a long effective life, despite the adverse effects of the sun's ultraviolet radiation and corrosion and clogging because of acidity, alkalinity, or hardness of the heat transfer fluid, freezing of water, or deposition of dust or moisture on the glazing and breakage of the glazing from thermal expansion, hail, vandalism, or other causes. These causes can be minimized by the use of tempered glass. In the following two sections, more details are given about the glazing and absorber plate materials. Most of these details also apply to other types of collectors. A third section refers to the collector construction and types of absorber configurations used.